The French Defense Procurement Agency has awarded CNIM a contract for modernization of PTA ground force projection systems (Fast Bridge laying System). 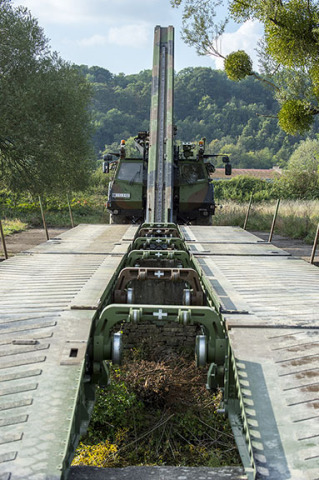 This automatic launching system, designed and developed by CNIM, delivered in 2011, in just 10 minutes deploys two MLC 100 bridges, 14 metres long or one MLC 80 long bridge,, 26 metres long, in order to project military tanks* over an obstacle (wet or dry gaps, such as a river or crevasse), the number of operators being limited to two with controls. Each PTA is made up of two vehicles (bridging** and additional semi-trailer bridge carriers), and is designed to drop or recover the bridge elements it transports automatically. The Army is currently equipped with 10 vehicles incorporating the bridge (or pontoon) launching and recovery systems, with 10 semi-trailers carrying additional bridge elements, and 40 bridge elements. CNIM's mission as part of this modernization contract is to increase the operational performance of the French Army's modular assault bridge over its entire lifespan. In order to facilitate haulage and bridging operations while ensuring optimal detection of external threats, a latest generation optronic vision system, produced by the subsidiary Bertin Technologies, will be integrated. It will offer the pilot and his skipper an all-round vision by day and by night. Thus, a larger number of cameras will observe the immediate SPRAT environment. The supervisory command and control system for all PTA technical parameters will be modernized with the integration of a new IT architecture, offering a high level of maintainability. The first modified equipment will be delivered to the Army in mid-2019.